Designer Christopher Peacock shares his strategies for building the perfect kitchen, from the ideal island size to the right countertop finish. I avoid installing a television on a high cabinet. It’s ridiculous—you stand there looking up at the ceiling. I’ll put a TV on a counter or mount it between the countertops and upper cabinets, sometimes on a swiveling bracket. 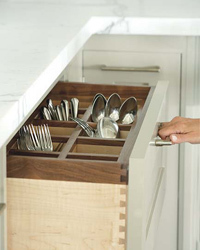 Hardware is the jewelry of cabinetry. I give the other surfaces—countertops, floors—low-sheen finishes so that a piece of polished metal really jumps out. It’s like a great pair of earrings that makes an outfit. We get a lot of people saying, "Oh, my friend told me never to use marble on countertops. It stains." That’s true only to a degree—and relative to a piece of granite. Marble doesn’t stain that easily. The style of a fixture is key to setting the tone and character of the room. In this kitchen I chose "Menton Hanging Shade" pendants from Vaughan ($1,850 to the trade). 1. Television I avoid installing a television on a high cabinet. It’s ridiculous—you stand there looking up at the ceiling. I’ll put a TV on a counter or mount it between the countertops and upper cabinets, sometimes on a swiveling bracket. 2. Hardware Hardware is the jewelry of cabinetry. I give the other surfaces—countertops, floors—low-sheen finishes so that a piece of polished metal really jumps out. It’s like a great pair of earrings that makes an outfit. 3. Marble Countertops We get a lot of people saying, "Oh, my friend told me never to use marble on countertops. It stains." That’s true only to a degree—and relative to a piece of granite. Marble doesn’t stain that easily. 4. Lighting The style of a fixture is key to setting the tone and character of the room. In this kitchen I chose "Menton Hanging Shade" pendants from Vaughan ($1,850 to the trade). I always do a honed finish for countertops. You lose the beauty of stone when it has a polished surface, and it shows scratches. With a honed finish, scratches are less visible, and you can use a lightly abrasive cleaner like Soft Scrub. A few clients have asked to have all the hardware, including hinges, made of solid sterling silver. It looks amazing, but for one kitchen the hardware alone was $30,000. I don’t like having the kitchen open to the rest of the house. If you like to cook, there’s something magical about being in a real kitchen and cooking. I think you lose that feeling of enjoyment when the kids are there, watching the big-screen TV and screaming. Right now there’s a movement back to enclosed spaces. I love my French top from Wolf—I show it to everyone. It’s a flat cast-iron surface that’s hottest in the center, above the gas burner, and gets cooler toward the edges. It’s great for slow cooking and steaming— I control the heat just by sliding the pots around. We’ve really moved away from building a desk in the kitchen. Clients weren’t sitting down at these desks very often; they were just checking e-mail or printing something. Most people now have wireless Internet, so they just open a laptop on the island and put it away when they’re done.